Megachile. A still taken from the video below. Identification: Megachile individuals have smokey-colored, stout bodies and flattened abdomens with pale hair bands. Females often have broad heads to accommodate large mandibles for cutting leaves, and carry pollen in the scopae. Nesting Habits: Megachile are solitary, and nest in preexisting cavities, natural or artificial. A few dig nests in loose, sandy soil. They wrap brood cells in leaf or petal pieces and use the smooth side to face the cell. These leaves and petals are cut into particular sizes and shapes for the different parts of the cell (for example, the sides are oval pieces, and the cell is closed with circular pieces). In the main experimental Echinacea experimental plot we frequently observe Megachile individuals flying with dime-sized pieces of leaf. They cut leaves from ash trees near our experimental plot, and these round cuts are obvious on leaves growing on the short ash trees. Note this Megachile’s systematic circumnavigation of the flower head in her search for pollen. 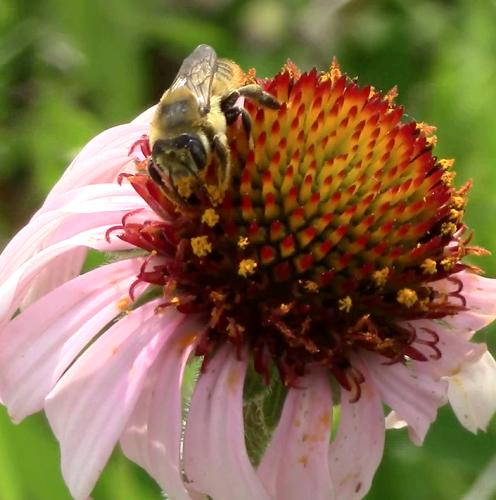 More videos of bees visiting Echinacea are available on the Echinacea Project Youtube.